Today's manicure is inspired by this adorable peter pan collar nail tutorial over at The Beauty Department. They do some really cute nail and makeup tutorials! I only discovered the site a little while ago so clearly I've been living under a rock haha. I'm kind of stuck in a nail art rut at the moment so I thought I would try the design out! It's a dodgy job as you can clearly see the black peeking out from beneath the white collars and my index finger is stuffed up. Oh well! I also completely stuffed up my right hand so it looks like I painted in the dark or something haha! I stuck pretty closely to the easy to follow tutorial. I used binder reinforcements to section off my nail and used 2 coats of Color Club Where's the Soiree for the shirt. I then used a small nail art brush and Kiss nail art striper in white to draw the collars. I then added 3 gold bullions down the centre of each nail. For my thumb I used 2 coats of Color Club Where's the Soiree and 1 coat of China Glaze Medallion. I could have done a much better job at cleaning up but couldn't be bothered oops! Also I need some new nail art brushes as mine are getting a bit tattered so they don't give a clean line. I look terribly silly in peter pan collar shirts but I loved wearing them on my nails instead! XD What do you think? These look absolutely beautiful, great job! This manicure it amazing! It also reminds me of Wednesday Adam's outfit from The Adams Family. So adorable, keep up the great work! This nail art is so pretty! I just found your blog and I love it! Am a new follower! I would love to be able to figure out how to do my labels and archive like you have yours! So neat and sleek! must google the how to! I must try to do it. So cute! 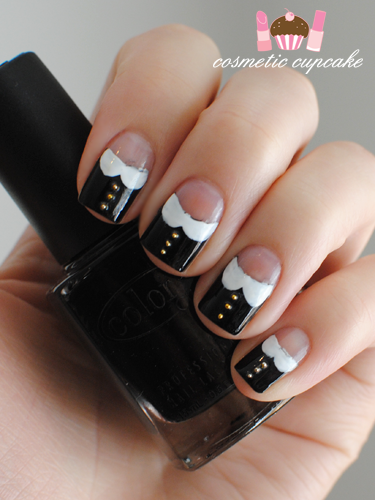 Nice twist on the tux nails!